We’re near the forefront of a new movement in business. That movement is to prioritize the employees as much as shareholders and customers. That’s not to say that some companies haven’t been doing that all along. There’s going to be some history in this post, so bear with me. Ideally, each of these stakeholders should be proportionately prioritized (as illustrated below). However, that hasn’t always been the case. The Triangle of Business Stakeholders with all stakeholders being proportionately prioritized. Shareholder primacy is a tricky thing. In business, there’s always been an assumption that the business is the property of the owner and exists to benefit the owner above all others. I believe both of those points to be true. After all, if the business owner didn’t take on the risk of opening and managing the business, then the customers wouldn’t be able to enjoy their products, and the employees wouldn’t be able to earn their wages. The error, I think, is when “shareholder benefit” is the only measure used to determine a business’s value. Although this philosophy had been employed early in the last century (Henry Ford was sued by two of his shareholders for raising employee wages instead of paying high dividends), it really hit mainstream in the 1980’s when a new age of business valuation dawned with the Capital Asset Pricing Model (CAPM). In many ways, the use of CAPM divorced investors from the management of the business, and directed them towards a stock-focused approach instead. In short, businesses were only as valuable as their stocks. Customer and employee satisfaction became irrelevant except to the extent to which they impacted the “bottom line”. 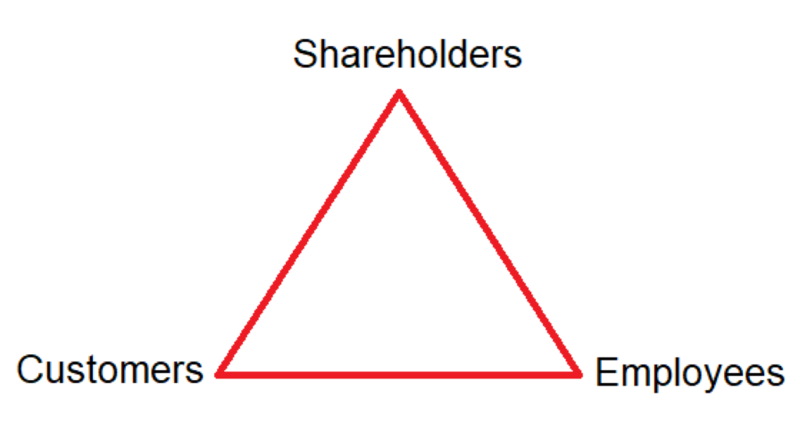 The Triangle of Business Stakeholders when shareholder primacy is active. Despite Shareholder Primacy taking off, no one can deny the impact that customers have on the business enterprise. They are the source of all revenue, and without customers a business will rapidly wither and die. As such, the idea of a customer-centrist operations model wasn’t far on the heels of Shareholder Primacy. Customer-centrism actually emerged in the 1960’s but didn’t become mainstream until the 1990’s and in to the early 2000’s. Customer-centrism introduced introduced ideas like buyer rewards, emphasized customer service, money back guarantees, warranties, etc. Predictably the philosophy was very profitable. Companies that successfully integrated customer-centrism rapidly began out-performing those that did not. As an example, consider the rise of Walmart over Sears, and the success of Amazon later on. Both Walmart and Amazon took steps to implement impressive customer-centrist strategies that benefited both their customers and their owners. In the 2010’s we began to see an additional change in corporate strategy. This change (re)introduced the proper prioritization of employees. However, it’s slow going. The “problem” with employee prioritization is that it doesn’t yield the same immediate return that customer-centrism does. That is, making your customers happier results in higher sales. An equivalent correlation is not obvious when making your employees happier. So … is it worth trying to make your employees happy? Well, that depends on your business philosophy. If you are still rooted in the idea of shareholder primacy, then your answer may be “No”. And that would be a mistake. The greatest argument in favor of Employee Prioritization, and the one that I encourage, is altruism. My personal philosophy is that shareholders, customers, and employees should all derive meaningful benefit from the existence of my business. If not, then I have failed in some way. Happy employees are more likely to cooperate, share ideas, suggest improvements, etc. It may be argued that many of the social conflicts that we see today – such as policies calling for higher wages, the sentimental embrace of socialism, the wholesale rejection of capitalism, etc. – may have been avoided if employers had more readily embraced the proper prioritization of their employees. On the horizon, and approaching fast, is the advent of a new stakeholder type: society. This can manifest in a variety of ways, from companies releasing statements in support of social causes, to companies taking major leaps in reducing their carbon footprint. The overall direction that this stakeholder accountability will take is yet to be seen. My concern is that it may be too much too fast. 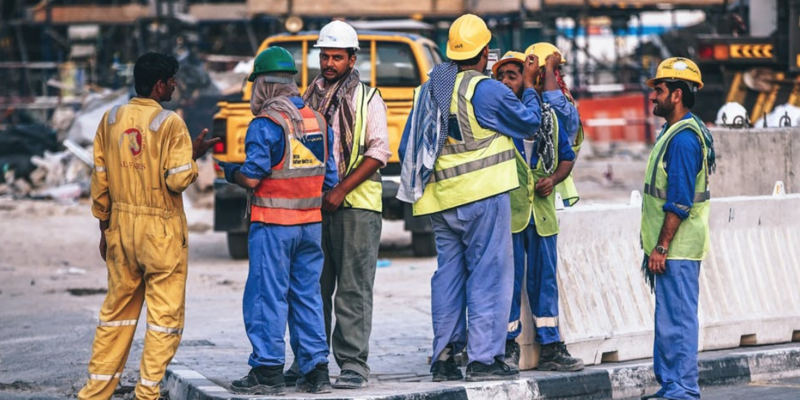 With many companies still struggling to implement employee prioritization, the new problems of social accountability (and environmental responsibility) may supplant employee prioritization. This could result in socially responsible, “green” companies with employees that – more and more – hate their jobs. In closing, my plea is to not forget your employees. Make them a priority. Treat them fairly and your business, as well as your own personal fulfillment, will grow and expand.